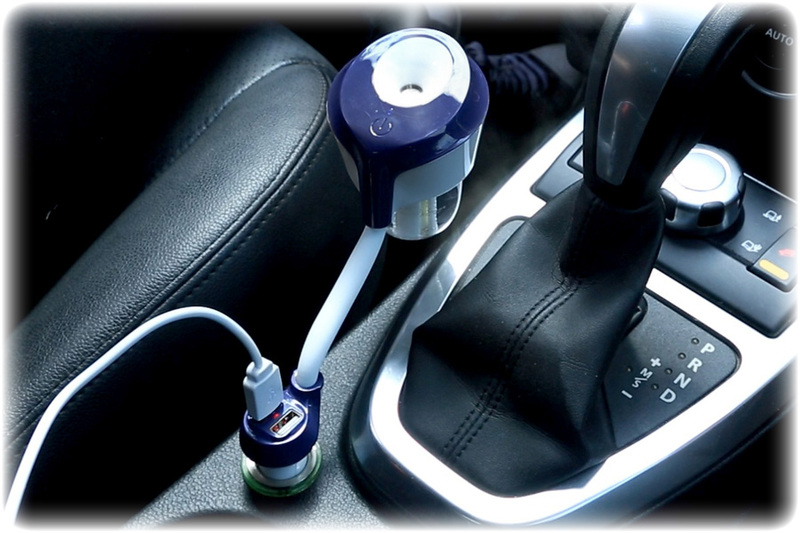 Freshen up your car and feel alive with our all new Mini 2-in-1 Car Humidifier and Diffuser. You can add any fragrant oil to our car air diffuser, so your car can smell like a tropical breeze or a field of flowers. Do you struggle to breath from the dry air conditioning? Our Mini 2-in-2 Car Humidifier and Diffuser sends out a fine mist that puts the moisture back in the air and lets you breathe easier. Our 2-in-1 sends out a fine mist that puts the moisture back in the air and lets you breathe easier. Aromatherapy can be used to relief stress, increase energy levels and to stimulate the brain. There are no chemicals in the car diffusers so you can breathe happily in a toxin free environment. It can be used in any angled car port as the bendable neck means the diffuser can always stay upright. With the automatic off function your diffuser will switch off after 2 hours of use, meaning you can stay safe at all times. There are two USB ports that let you charge other electrical items with making the most out of your diffuser. I like my car smelling fresh and this product definatley does that! Bought one for my wife and daughter. I'm very pleased with my purchase, I love putting different oils in the diffuser. My car smells so fresh all the time! I have been looking everywhere for a product like this! It makes my car smell amazing and genuinely makes me feel a lot more calm and less stressed when I am driving. Great buy!